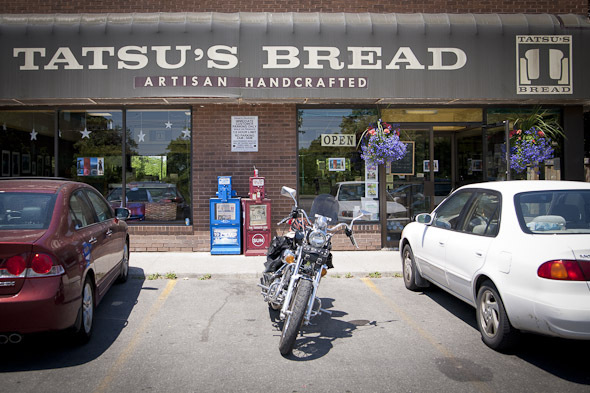 Tatsu's Bread expresses its art through its handcrafted artisan breads. Everything else, it leaves to the students at nearby Humber College. This bakery at Lakeshore and Kipling has become the go-to spot for students looking for a coffee, sweet treat, or freshly made sandwich, and its walls are covered with Humber student art. On weekends, too, Humber students drop by, often to check out their peers playing weekly Saturday jazz events. When I stop in, however, there are no students in sight, except for perhaps a few of a much small creed--one of whom is throwing a wicked temper tantrum. "Daddeeee," the little girl says, wailing and thrusting a little finger at the cookies behind the glass. Was she pointing specifically to the cranberry spelt cookie (1.65) made with soymilk? It seems they develop quite refined taste fairly early here in the west end. "I whhaantt one!" The father, admirably, waits out the ferocious tantrum. I leave them be and check out Tatsu's collection of artisan breads. While owner and master baker Tatsunobu Sato isn't in this day, his staff fills me in on his baking philosophies. 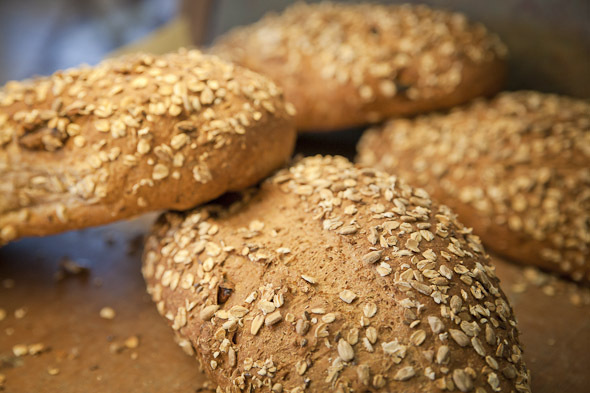 "The artisan breads are made with organic ingredients," one woman says. 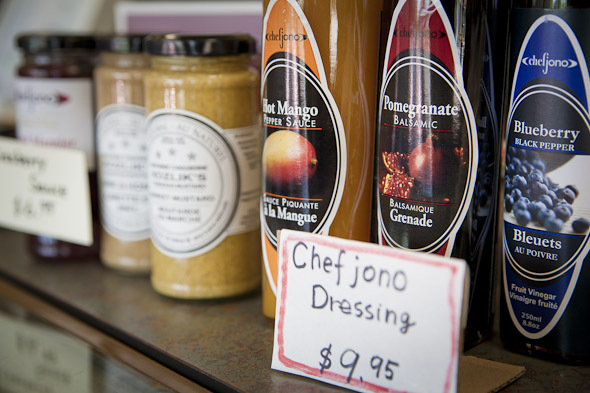 "There are no preservatives, and we make them fresh here everyday." The entire collection of breads collection includes whole wheat loaf (($4.45) muesli bread ($3.38), raisin bread ($2.95), and multigrain ($2.75). There are also spelt loaves and walnut loves, but alas, I'm distracted from my gazing by another shrill shriek. Tastu also makes bagels in some unusual varieties such as spinach ($2.14) and potato ($2.14). But looking for a little more sustenance, I order a veggie sandwich ($3.95) after mulling between that and the curry tuna ($3.95). My optimism was challenged slightly when I see that my sandwich was already made, wrapped and waiting for me behind one of Tatsu's glass counters. 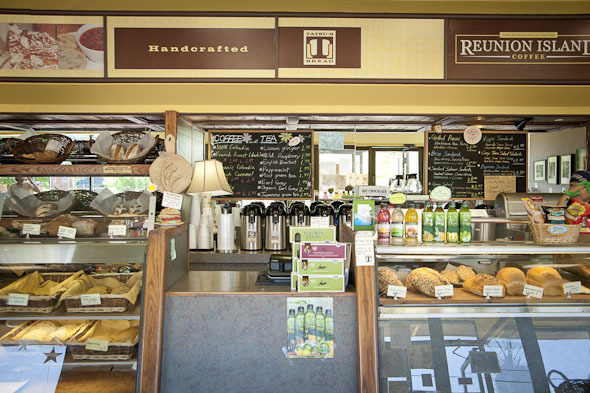 But really, I couldn't tell the difference, and the staff tells me the sandwiches are constantly being made. The multigrain bread was cut nice and thick, housing a fresh collection of tomato, avocado, cucumber, sprouts, and homemade mayo. I found the amount of mayo to be a little stingy, but other than that the sandwich was crisp and refreshing for a warm day, and certainly made a winner by the soft bread and crunchy crust. There's also lots of seating to enjoy a cup of fair trade coffee ($1.60), a chai tea ($1.75) or a cookie, tart, or macaron. And luckily, if you're over three years old, you can get exactly what you want.